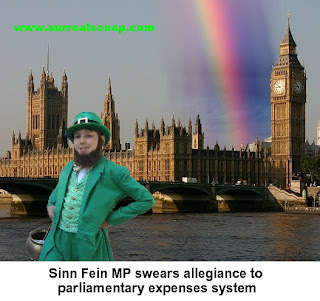 After decades of refusing to acknowledge the legitimacy of the UK in governing Northern Ireland, the political wing of the IRA’s most senior politicians today admitted a deep allegiance to Her Majesty the Queen’s parliamentary expenses system. "Feck me, that’s a big pile of cash now, to be sure," swore Sinn Fein leader Gerry Adams upon learning that the Daily Telegraph has calculated that 5 Sinn Fein MPs have claimed £500,000 in London second home allowances despite refusing to take up their seats in Parliament. "It would be wrong to say we don’t like the British presence in Northern Ireland. We love all the folding pictures of the Queen that you can put in your wallet!" The Sinn Fein MPs denied there was any wrong doing claiming that they required the London homes for important business such as not taking up their seats in Parliament, not swearing allegiance to the crown and not voting on matters affecting Northern Ireland. All of which they claimed would be impossible to not do without travelling over to London at the British taxpayer’s expense to not do them. "Given the choice where would you rather be when not doing your job as an elected representative of the people of Northern Ireland? Belfast or London?," said Shamus O’Billingsworth. "Exactly. You have clearly been to Belfast." Sinn Fein denied that there was also anything irregular about the size of rents that the MPs had claimed despite evidence that they are over twice the market rate for rental properties in the area. "You have to understand that in the years that members of Sinn Fein have been not sitting in parliament and not representing their constituents has coincided with several explosions in the London housing market," said O’Billingsworth. "The costs of property has blown the roof off rental prices. Which is why we view these explosive allegations as rather incendiary." However the controversy over MPs’ second home allowances and expenses claims has led to cross-party calls for reform and Sinn Fein is now leading that charge. "Whilst we refuse to acknowledge our obligations as MPs in Westminster we fully support the idea of moving the commons to the British Virgin Islands as a means of making the claiming of expenses more efficient," said O’Billingsworth. "But I swear to you we will travel to the new chamber to denounce everyone in it and refuse to take our seats. Unlike the first class seats we would undoubtedly take on the plane over. We would need the extra space to be as non-productive as possible for the people of Northern Ireland that we will continue to not represent."